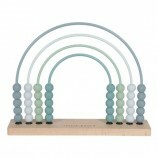 The gorgeous Little Dutch wooden rainbow is a wooden stacking tower in the shape of a beautiful rainbow.The rainbow looks great in a child’s bedroom on display – and also makes a fabulous toy which is super fun to play with. 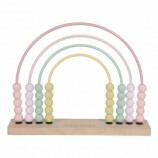 The rainbow consists of 8 arches that fit on and in each other. Let your child explore these shapes to play and learn and to make all kinds of creations by using their imagination. The arches can also be used as a train tunnel, a house for little dolls or mountains for little cars. Available in 2 colour ways – multi-colour blue and multi-colour pink. Suitable for children aged 12month+.